Piano Solos. Composed by Dave Brubeck. Edited by John Salmon. Artist/Personality; Piano - Personality Book; Piano Supplemental. Alfred Masterwork Edition: At the Piano. Jazz. Book. 56 pages. Alfred Music #00-31916. Published by Alfred Music (AP.31916). ISBN 0739057359. English. Dave Brubeck. Dave Brubeck is a worldwide musical legend. 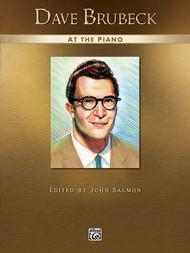 Brubeck, working closely with his protege John Salmon, has written a volume of newly composed works for the jazz piano world. Get ready for a real musical treat! Titles: All My Love * As the Moon Is to the Sun * Crescent City Stomp * Day After Day * Happy New Year * Her Name Is Nancy * I Love Vienna * Mariel * Regret * Snow Falling from the Sky * So Lonely * A Song for Bessie * Themes from "Elementals" * Waltzing. As the editor says, one needs big hands, but these pieces are well arranged and clearly printed and capture the Brubeck magic, Very enjoyable. I have heard Brubeck play these selections in person and am happy to have the sheet music. 34 of 65 people found this review helpful.